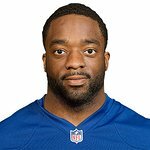 A 2013 Heisman Trophy Finalist and First-Team All-America selection, Andre Williams graduated from Boston College in three-and-a-half years with a bachelor’s degree in applied psychology and human development prior to being selected by the New York Giants in the fourth-round of the 2014 NFL Draft. In addition to his on-field accomplishments, Williams is also writing a philosophical memoir entitled “A King, a Queen and a Conscience” which is expected to be released in 2015. Google trends for "Andre Williams"
We don't have any videos related to Andre Williams.